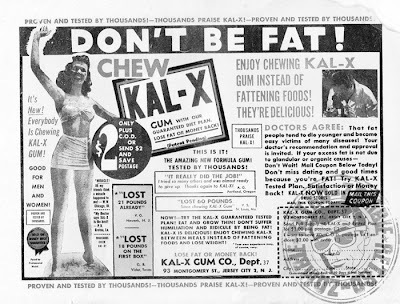 Being Retro: Feeling FAT... on a FRIDAY? Even in the 1950s some great lose weight options were out there, this one was made with lead paint... I wonder why it didn't survive. Isn't this the name of Superman's Krypton name "Kal-X", I kid you I know it's not... but it made you think for a second. So what are your plans for the weekend, for me I don't want to see "Total Recall" for the obvious reasons... but for one I would and I know me and Alex share the same dream girl... Kate Beckinsale. So I would like to thank you all for this week, it has been one hell of a trip... you all rock! If you haven't seen the new banner flying above the top please do, I am really not trying to sell... wait I am but I finally got something good that I hope you all will like. Kate might be there, maybe! Happy Friday and have an absolutely wonderful and relaxing weekend. I like her for all sorts of reasons! Thank you for the awesome photo. Jeremy, I gave you and your amazing artwork a shout out today at The Imaginarium. Can't wait to get my tees. good luck with the T-shirt business, zombie! Kate and Colin...I guess I will have to see it!